Benjamin Nowland (Honors Mechanical Engineer, Grad. Cert. Environmental Management, Cert. IV Training and Assessment, Certified Health Practitioner and Yoga Teacher) shares original perspectives on health and spirituality. Ben is the best-selling author of Playing GOD Biological and Spiritual Effects of Electromagnetic Radiation a book created to stretch perceptions whilst easily digested by the householder. He has spent two decades exploring human potential, the infinite and eternal. His writing conveys revelations with rawness and simplicity. Ben's early material success segued into a cataclysmic 12-month period during which he lost health, wealth and relationships. Profound healing insights were received. Ben now supports others on their journey of transformation. He loves talking to groups along with one-on-one healing consultation work through Dharam House. One way the heart communicates with the brain and the rest of the body is 'energetically'. If the electromagnetic energetics of the heart are altered so are the resultant communication signals. In fact, heart transplant recipients often show a different personality post-operation, literally having a 'change in heart'. This electromagnetic field is a constantly shifting spectrum of frequencies with vast amounts of information contained in each frequency. 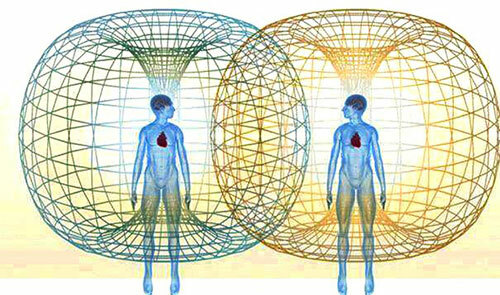 This field is torus shaped (pictured above), just like the energy field of all living organisms, including the cells of our body, plants and the earth. Entrainment occurs in-utero and during infancy. The field of an infant is entrained through the mother's electromagnetic field. This is the basis for the developmental psychology understanding of the impact of the mother's emotional state during pregnancy and postnatal period. Depending whether a mother experiences protracted fear or love during pregnancy, her electromagnetic field entrains the vibrational energy field of her child accordingly. However, as adults our unique signature field can also be entrained. Today, with increased exposure to microwave radiation (especially from wireless communication technology), we are now overlaid with electromagnetic fields at levels often millions of times higher than two decades ago, which is unnaturally distorting our energy field. So, if for no apparent reason your health is feeling 'off', consider whether microwave radiation exposure may be a contributing environmental factor. Along with radiation power density levels, the shape of radiation is an important factor for human health. Microwave transmissions can be in the form of pulsed modulated linear-synthetic waveforms [on/off rectangles] which are vastly different to the non-linear fields of our body-mind, which are also found throughout Nature. Exposure to these forms of microwave radiation therefore has a disruptive effect on the body and its electromagnetic field. Current 4G (LTE) technology was launched prior to any studies on its physical/energetic effects. ...may all be examined from the perspective of energy field discordance. Again, if you are suffering from these symptoms, consider whether microwave radiation exposure may be a contributing factor. Exposure factors: Cumulative chronic and acute episodes 'add up' to leave us more susceptible to physical decline. Environmental factors: Multiple toxicity factors including mould, chemicals and bacterial infections compound the effects of exposure. You are at home and you hear the door opening. Before your partner enters, you know he has had a bad day. 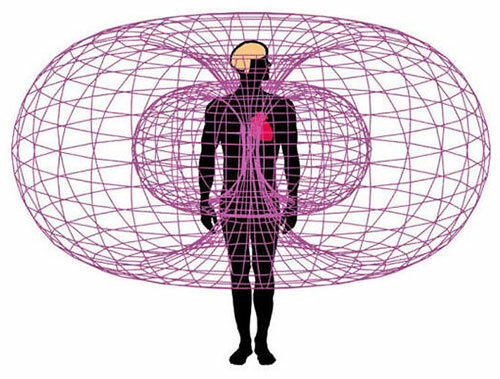 Your 'antennas' (energy field through the aura and heart especially) picks up his transmission. If your field is weak (low amplitude) it may entrain to the 'frustration field' of your partner. Soon the shared field is one of discordance and arguments. I call this phenomenon 'psychic pollution'. When we pick up the incoherent electromagnetic field of our partner, our emotional state is influenced. Microwave antenna towers can be considered frustrated partner equivalents. They generate incoherent waveforms at multiple frequencies (overlaying to generate noise). We receive and process these electromagnetic fields in the same way we receive and process (or interact with) the electromagnetic field of our partner. Disease or disease that was about to develop, shows on our unique signature field as jagged incoherent waveforms concentrated in the low and high frequency bands. 'Deficiency pattern' diseases such as cancer and chronic fatigue syndrome showed up as incoherent patterns in the high frequencies. Wellness begins in the energy field! Continue seeking to optimize inner health and harmony (deep happiness) and the result will be a strengthened personal energy field that is less susceptible to entrainment from psychic and electromagnetic pollution. "Do I want to take on these energies or do I now decide to radiate my own energies?" Observe your tendency to want a 'magic pill', a device or pendant. You do not need a $400 device claiming to 'protect' you from radiation. A mindset shift is required. Your passage with radiation pollution sickness (mild to severe symptoms) is a unique opportunity for inner transformation. Based on experimentation and research, I do not recommend spending thousands of dollars on products, as I did. Follow your inner guidance. Occasionally we are drawn to something intuitively (versus coming from a place of desperation). After trialing many products my preferred support came from a couple of $10 crystals. They were not used to 'protect' me from radiation pollution but rather to aid the internal processing of a vibrational stage of my journey (a few months only). Focus on inner health and skip the products unless they really call you. What if your family switched off all Wi-Fi and other emitting devices and from 8pm to 8am each day? This may require an upheaval of your life. Seek to see the gifts in the changes you need to make and what initially may feel like a 'loss of freedom'. As you regain your health you may ask, "How can I give back to the consciousness shift I have chosen to be part of?" You will be 'microwave savvy' by now, so, how can you share your new insights and take action at family, school and community levels? In a visual-sense dominated world, even a five minute chat about your experience with invisible microwave radiation pollution can create a shift in others. This is a crucial year to demand telcos turn down the 'volume' on the antenna tower in your suburb, reject smart meters and share awareness on the topic with local council, state and federal parliamentarians, school parent and teacher groups and friends. We are asking the Australian Medical Association and the Australian Radiation Protection and Nuclear Safety Agency - "the federal government agency charged with responsibility for protecting the health and safety of people, and the environment, from the harmful effects of ionizing and non-ionising radiation"  - to reduce limits by 100 times as an immediate action" with more to follow. Currently there is no recognition of electromagnetic radiation as a contributing environmental factor in illness, so you will likely be derided by your doctor if you bring it up! Studies of cultures show pathological organisms dominate when exposed to electromagnetic radiation. The 'mystery' illnesses such as Lyme-like infections and Ricketts for instance are linked to electromagnetic radiation toxicity. Studies show mould generates far more toxicity when radiation exposed. Has similarities with multiple chemical sensitivity, relating to underlying changes of the nervous system. I've offered to guide doctors to the next level of understanding on this topic and have so far met (mostly) resistance, however alternative health practitioners are embracing new concepts. Change is afoot. Can you talk to a group of doctors and health practitioners in your town? B Nowland, Playing GOD Biological and Spiritual Effects of Electromagnetic Radiation, Fontaine Press, 2015, p. 132.B Nowland, p. 87. N Ozaniec, Chakras "A Beginners Guide, Hodder and Stoughton, 1999, p. ix. Electromagnetic Hypersensitivity Public Hearing, European Economic and Social Committee, Brussels, Belgium, 4 November 2014, viewed 23 December 2014, http://www.eesc.europa.eu/?i=portal.en.events-and-activities-electromagnetic-hypersensitivity. Electrosensitivity UK News, vol. 11, no. 2, July 2013, viewed 23 December 2014, http://www.es-uk.info/attachments/article/9/esuknewsJun13b2.pdf. Austrian Medical Association Guidelines for Diagnosing and Treating Patients with Electrohypersensitivity, Consensus paper of the Austrian Medical Association's EMF Working Group, 3 March 2012. D Childre and H Martin, p.33.